There are also reasons to wait to come out to others. If you are under 18 and/or financially dependent on others, you may not want to come out if there is a chance you will be kicked out of your home or left to fend for yourself. If you fear harassment, abuse, or loss of emotional support, this too may be reason to put off coming out until you are in a more secure position. If you are unsure about whether or not to come out, take your time and think things through rather than acting impulsively. 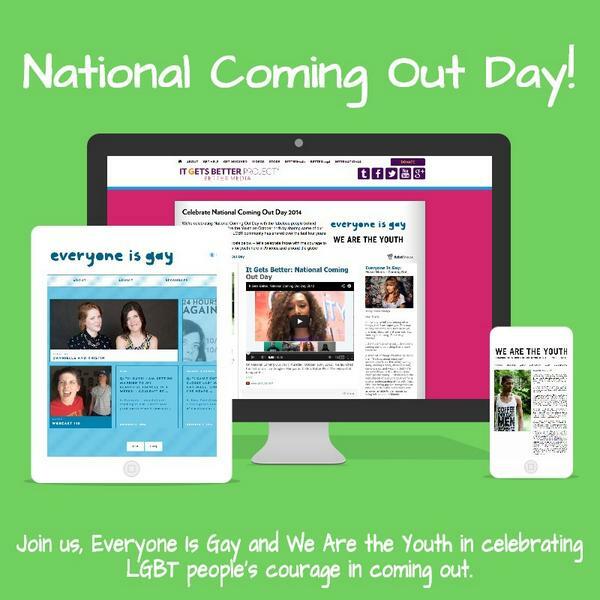 Read books or magazines by and for LGBT youth. Watch a video about LGBT issues, join an online community, or call an LGBT hotline. If there is a youth group or trusted adult to whom you can safely and confidentially turn, take advantage of this option. You may also want to keep a daily journal of your reflections, questions, thoughts and fears until you are clear as to the right path for you. The full GLSEN resource is here. Can you even believe that it’s Coming Out Day again already? And this year — in the wake of momentous gains on marriage equality and the dramatic shift in public opinion that has pollsters scratching their heads and candidates adjusting their strategies — it’s also the opportunity to explain why coming out still matters. Seriously. The White House is posting marriage equality memes on Instagram, the Supreme Court has just ended marriage discrimination in a majority of states and Modern Family is the top rated show on television. Even the Honey Maid Graham Crackers folks are on board with adorable commercials featuring fabulous two-dad families. How much more out do we need to be, for heaven’s sake? Aren’t we done yet? The answer of course is no. We are not done. And we won’t be done until no gay kid is afraid to go to school because he’ll be bullied. We won’t be done until no lesbian teenager is afraid to walk home because she’ll be jumped. We won’t be done until no transgender woman has to hope she can make it to the ATM and back to her car without “an incident.” And we won’t be done until no child ever has to grow up being taught by his youth pastor that he is an abomination to God. We won’t be done until this story — Chad’s story — has become a sad chapter in our history rather than a sad reality in our present. That’s why this year on Coming Out Day I’m Coming Out again, all right. But I’m not just coming out as a lesbian — which frankly by now is breaking news to absolutely nobody. I’m Coming Out as a Christian. I’m going to do whatever I can to offer a rebuttal to the rabid rhetoric of the religious right who have taken the Good News of God’s inclusive love and distorted it into a weapon of mass discrimination. Of humiliation. Of homophobia. Because the stakes are too high. Because the damage to precious souls is too costly. And because the truth that there are people of faith who proclaim justice and compassion — not judgment and condemnation — is too important not to step up and speak out. As Harvey Milk said “You must come out … and once and for all, break down the myths, destroy the lies and distortions.” And for me as a Christian, those lies and distortions include hijacking my faith and turning it into weapon to wound God’s beloved LGBT children. So Come Out, Come Out wherever you are. Come Out as proud LGBT members of the rainbow tribe. And if you happen to be the Christian variety, then Come Out as a Christian, too. Break down some myths. Destroy some lies and distortions. And if we do it long enough and loud enough and together enough eventually we will be done. And October 11th will roll around and nobody will need to Come Out because there won’t be any closets left. And wouldn’t that be fabulous?